January 2019 marks the centennial of the death of Theodore Roosevelt (October 27, 1858 - January 6, 1919). The New York State Library honors this great New Yorker by exhibiting a few items from the collection written by and about Theodore Roosevelt. The Rough Rider himself. President. Historian. Cowboy. Police commissioner. Trust-buster. Explorer. Naturalist. Big-game hunter. Nobel Prize-winner. He has been president once – and wants the job again. Only the hand of God can keep him from the White House in 1920. On January 6, 1919 Theodore Roosevelt died unexpectedly in his sleep at his home, Sagamore Hill, after being hospitalized in November and December of 1918 for inflammatory rheumatism. His illness was likely and unfortunately compounded by the malaria he had contracted on his trip to Brazil in 1913-1914. The Vice-President at that time, Thomas Marshall, is quoted as saying "Death had to take him sleeping. For if Roosevelt had been awake, there would have been a fight." 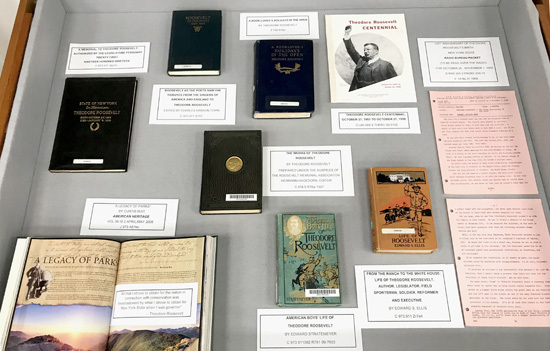 The large exhibit cases highlight memorials on the death and life of Theodore Roosevelt, as well as pictures and books about his life and accomplishments. Indeed, many, many, many books have been written about Roosevelt since he himself began chronicling his own life. 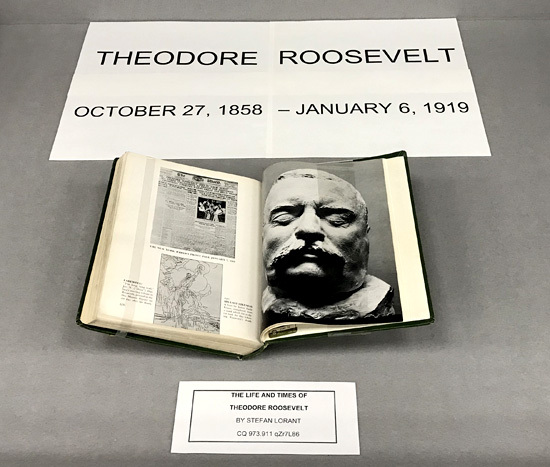 Of note, on exhibit are two pages from Stefan Lorant's book The Life and Times of Theodore Roosevelt featuring an image of a newspaper announcement of his death, a drawing by his friend and fellow conservationist Ding Darling, and an image of his death mask. Also of note in the large cases are three books written about Theodore Roosevelt by David McCullough, Doris Kearns Goodwin, and Paul Grondahl. Next to these books are quotes from these authors about what drew them to writing about Theodore Roosevelt. 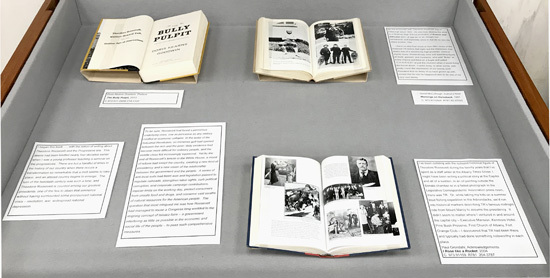 The smaller exhibit cases highlight some of TR's time in New York, from birth to 'living memorial'. TR was a native New Yorker. He was born in New York City and the home he lived in is now a National Historic Site. 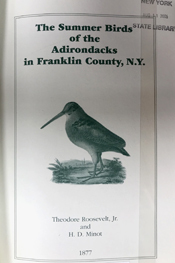 He spent time in the Adirondacks as a youth, and his first published work was The Summer Birds of the Adirondacks in Franklin County, NY. Written with his friend H. D. Minot, it is an annotated listing of birds they had observed in Franklin County. A 2001 reprint is on display. When Roosevelt first read the book, he sought out the author at the Evening Sun offices. Missing him, TR left his card, with these words on the back: "I have read your book and I have come to help." The dawn of the reform era in the police department began on May 6, 1895, when sixty-eight-year-old mayor William L. Strong, a former bank president, in a brief 10 a.m. ceremony at City Hall, swore Theodore Roosevelt in as police commissioner. Roosevelt was elected Governor of New York State in 1898 and served in that role from 1899-1900, when he was elected as the Vice-President of the United States. Editor Gilbert J. Black notes in Theodore Roosevelt 1858-1919 that as governor, Roosevelt "signed bills regulating tenement sweatshops, utilities and insurance companies, food and drugs, child labor, minimum pay for teachers, 8-hour day for state employees, factory inspectors" and enacted many other reforms. While hiking, Roosevelt received word that McKinley was dying. After a wild night ride by buckboard he reached his special train in North Creek to learn McKinley had died. In Buffalo on the 14th, Judge John R. Hazel of the United States District Court administered the oath of office in the library of the Ansley Wilcox home. On a damp night in September, 1901, a man muffled in a heavy overcoat with a slouched hat pulled down over his eyes jumped in a waiting buffy; the horse leaped forward into the darkness – an historic ride had begun. Of all the dramatic happenings of that day the thing I remember the most vividly is the excitement of being allowed to sit up long after my bedtime to stand in the muddy road and wave goodbye. The man who started on that ride was Vice-President of the United States; when his exhausted and mud-spattered hours brought him to his destination, he was President. 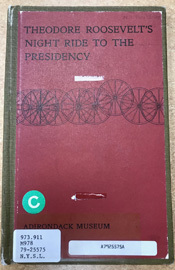 Eloise Cronin Murphy shares her story in Theodore Roosevelt's Night Ride to the Presidency published by the Adirondack Museum (now known as the Adirondack Experience, the Museum on Blue Mountain Lake). Murphy was the daughter of Mike Cronin who drove Theodore Roosevelt from Aiden Lair to North Creek where he caught a special train to Buffalo. During his tenure as President of the United States, Roosevelt maintained a "Summer White House" at Oyster Bay, NY called Sagamore Hill. The Roosevelts had made their home at Sagamore Hill since 1885. It was to Sagamore Hill that Roosevelt returned after his stay at the Roosevelt hospital in late 1918, and here he died and is buried in the nearby Youngs Cemetery. His cousins, Emlen and Christine Roosevelt, who lived adjacent, donated twelve acres to the Audubon Society for a bird sanctuary, fittingly as a "living memorial to a great man." Berman, Jay Stuart. Police Administration and Progressive Reform: Theodore Roosevelt as Police Commissioner of New York. Chessman, G. Wallace. Governor Theodore Roosevelt: the Albany Apprenticeship 1898-1900. Garraty, John Arthur. Theodore Roosevelt: The Strenuous Life. Goodwin, Doris Kearns. The Bully Pulpit: Theodore Roosevelt, William Howard Taft, and the Golden Age of Journalism. Grondahl, Paul. 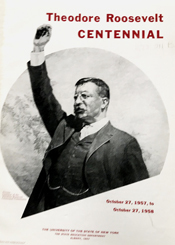 I Rose Like a Rocket: The Political Education of Theodore Roosevelt. Jeffers, H. Paul. Commissioner Roosevelt: The Story of Theodore Roosevelt and the New York City Police, 1895-1897. Johnston, William Davison. TR: Champion of the Strenuous life. Kohn, Edward P. Heir to the Empire City: New York and the Making of Theodore Roosevelt. Lorant, Stefan. The Life and Times of Theodore Roosevelt. McCullough, David G. Mornings on Horseback. A Memorial to Theodore Roosevelt: Authorized by the Legislature February Twenty-First, Nineteen Hundred Nineteen. Morris, Edmund. "The Cyclone Assemblyman" American Heritage vol 30, is 2 p 34-43. Murphy, Eloise Cronin. Theodore Roosevelt's Night Ride to the Presidency. New York State Radio Bureau Packet. "100th Anniversary of Theodore Roosevelt's birth". Pietrusza, David. 1920: The Year of Six Presidents. Roosevelt, Theodore. A Book-lover's Holidays in the Open. Roosevelt, Theodore. Works of Theodore Roosevelt. Prepared under the auspices of the Roosevelt Memorial Association: Hermann Hagedorn, editor. Sells, Edward S. From the Ranch to the White House: Life of Theodore Roosevelt, Author, Legislator, Field Sportsman, Soldier, Reformer, and Executive. Stratemeyer, Edward. American Boys' Life of Theodore Roosevelt. Theodore Roosevelt Centennial, October 27, 1957 to October 27, 1958. Theodore Roosevelt in New York State: Places in the Empire State Associated with the 26th President which may be Visited by the Public. Town, Charles Hanson, editor. Roosevelt as the Poets Saw Him: Tributes from the Singers of America and England to Theodore Roosevelt. Wilcox, David H. The Ansley Wilcox House and Its Furnishings: Theodore Roosevelt Inaugural National Historic Site, Buffalo, New York. Search for "Theodore Roosevelt" in the online catalog to discover the many, many more holdings on TR at the New York State Library! Exhibit curated by Kerry Shermer and Michael Meyer.